Jacqueline Kelly on Jacqueline Kelly: “Born in New Zealand, raised in western Canada, moved to Texas in high school. Undergraduate degree from UT El Paso, medical degree from UT Medical Branch Galveston, law degree UT Austin. Presently working part-time as a physician and life-care planner, forecasting future medical needs for the catastrophically injured. Note: photo by Deanna Roy. What kind of child were you? Who were your favorite authors? I was a bookish child, but apparently a high-energy one (my first nickname was “Cannonball”). I think probably all writers start out as bookish children. I adored Kenneth Grahame‘s The Wind In The Willows (1908), and all the Doctor Dolittle books by Hugh Lofting (1920-1952) et. al. Could you tell us about your apprenticeship as a writer? 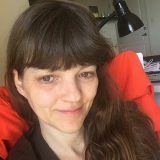 I started out writing short stories some years ago, taking classes and workshops whenever I could find the time. My novel started out life as a short story. I presented it to my writing group, and they all said that I should turn it into a novel. My reaction to that: “Aaaargh!” It just felt like too much to take on. A short story is relatively manageable, but a novel consumes your life for far too long. What was the single best thing you did to improve your craft? What, if anything, do you wish you’d done differently? I got over my self-consciousness about showing my work to others. I wanted so desperately for my writing to be good, but I was worried that it might not be, so I kept it hidden away in a drawer for a long time. If you want to improve as a writer, and if you want your work to see the light of day, you have to be willing to hold it up for criticism. Now I’ll show my work to anybody. Also finding the right writing group is incredibly important. I’m so lucky to be in a great group here in Austin. We formed during a short story writing class taught at the Writers’ League of Texas by Karen Stolz about eight years ago, and we have been meeting every two weeks ever since. The critiques are incredibly useful, and we have so much fun. Could you tell us about your path to publication? Any sprints or stumbles along the way? I entered three chapters in the Writers’ League Agents & Editors Conference in 2002, and ended up winning the mainstream division. 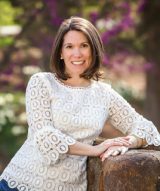 The woman who judged the contest, Marcy Posner, became my agent. At first I couldn’t confess to her that what she’d read as my entry was all there was. But I think she figured it out when it took me several years to get the rest of the book to her. The only other stumble I can think of is that I thought the first book cover Holt sent me was all wrong for the novel. I spoke to my wonderful editors at Holt about it, and they ended up re-doing the cover into what you now see. I think it’s just perfect for the book. It’s a real silhouette, cut by Beth White. You can find her artwork for sale online. 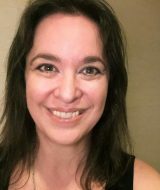 How did you find out that you’d sold your first novel? Did you celebrate, and if so, how? My agent Marcy telephoned me and told me. Unfortunately, my husband was hiking at the bottom of the Grand Canyon and was unreachable for several days! I called my family and close friends right away, and the next day my friend Gwen and I went to the Four Seasons for a celebratory lunch and champagne. What was your initial inspiration for writing this book? 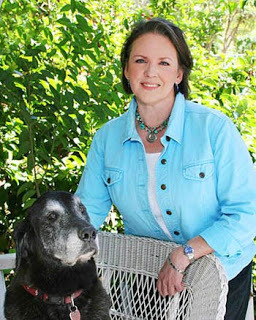 The book was inspired by my huge 140-year-old Victorian farm house in Fentress, a tiny community on the San Marcos River. I bought the house some years ago and promptly ran out of money to fix it up. The house is grand but falling down around my ears. One summer, I was lying on the daybed in the living room under the ancient air conditioner, which was barely cooling the room, and I thought to myself, how did people stand it in the heat a hundred years ago, especially the women, who had to wear corsets and all those layers of clothing? And with that thought, Calpurnia and her whole family sprang to life to answer the question for me. By the way, I made a promise to the house that if I made money from the book, I would use it to restore it to its former glory. If you could go back and talk to yourself when you were beginning writer, what advice would you offer? Just do it. Just sit down and write. You can’t wait for the muse to show up before you sit down. It won’t all be good, but a lot of it will be, and it will get better, the more you do it. Writers write. So far, other than your own, what is your favorite children’s-YA book of 2009 and why? 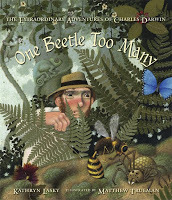 I love One Beetle Too Many: The Extraordinary Adventures of Charles Darwin by Kathryn Lasky, illustrated by Matthew Truman (Candlewick, 2009), and I really enjoyed Charles and Emma: The Darwins’ Leap of Faith by Deborah Heiligman (Holt, 2008). Are we seeing a common thread here? 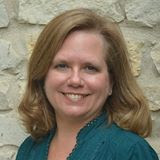 Several Austin children’s-YA authors have trained as lawyers (you, me, Greg Leitich Smith, Louis Sachar, Ruth Pennebaker, Jane Peddicord). Why do you think there are so many of us? A friend of mine, a very successful trial attorney, once said, “Every lawyer I know has got a novel hidden away in his laptop somewhere.” I think it’s because we all love language, and using it to convey precise ideas. Or maybe it’s because so many lawyers were English majors who couldn’t then figure out what to do with their degrees. What do you do when you’re not in the book world? I spend time in Fentress, I listen to KMFA, the local 24-hour non-commercial classical station (at 89.5 on your dial–plug! ), I enjoy visiting with friends and family. I love reading fiction, and I love talking about it with other fiction writers. My husband and I travel quite a bit. Two years ago we hiked across the Grand Canyon, a feat of which I’m inordinately proud, and I have the T-shirt to prove it. We visit New Zealand every few years to see my relatives, all of whom live there except for my parents, who live in Corpus Christi. New Zealanders are mad for dangerous outdoors activities, such as bungee jumping and zorbing. My husband has bungeed, but I haven’t. I may have to jump on out next trip before I get too decrepit. I have gone zorbing though, where they put you in a giant vinyl ball and roll you down the side of the hill. I screamed with laughter the whole way! We also went swimming with the seals on our last trip and will go swimming with the wild dolphins on our next one. What can your readers look forward to next? I have started a sequel to The Wind In The Willows. It’s tentatively called The Willows Redux. I only hope I don’t embarrass myself. Grahame was such an amazing writer, especially considering he lived such a sad life. But Ratty, Mole, Toad, and Badger live on, and have brought so much joy to so many. The book really is for all ages. Learn more about The Evolution of Calpurnia Tate (Holt, 2009), and read an excerpt of the novel. 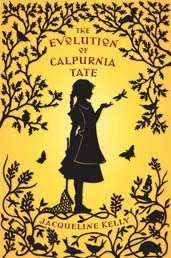 In the video below, check out The Evolution of Calpurnia Tate: ALA Book Talk by Lynn Rutan (a middle school librarian in Holland, Michigan; and book consultant) from Macmillan Children’s Books.